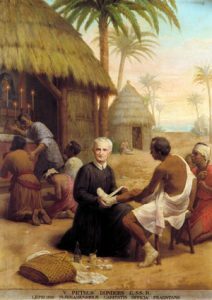 Peter Donders was born in Tilburg, Holland, on October 27, 1809, and as a boy he felt called to the priesthood. His family was poor, and his schooling was cut short so that he could learn weaving, which was his father’s trade. At the age of 22, he entered St. Michael-Gestel Seminary. Ordained a priest on June 5, 1841, Donders set out for Paramaribo, Surinam, a Dutch colony. For 14 years he ministered to the city’s 2,000 Catholics and regularly visited the plantation slaves, the military garrisons, and the indigenous people who lived along the rivers. In 1856 he volunteered to minister to people with leprosy at Batavia, where he remained for the next 28 years. In 1866, he joined the Redemptorists, professing his vows on June 24, 1867. These vows gave him a more vivid sense of the apostolic missionary community, and he left Batavia more often to minister to other pastoral needs. Donders died among his lepers on January 14, 1887. He was mourned as their benefactor and invoked as a saint. Pope John Paul II beatified Donders on May 23, 1982. Blessed Peter Donders is buried in Paramaribo.